Excipient World is an International Pharmaceutical Excipients Council of the Americas (IPEC-Americas) event. Excipient World (formerly ExcipientFest) was imagined in 2000 and launched in 2001 in Puerto Rico by Dwight Mutchler, President of IMCD US Pharma CMD (formerly Mutchler Inc.). The event was launched to address the need for comprehensive excipient education for pharmaceutical manufacturers and provide a marketplace to conveniently source excipient solutions from local excipient manufacturers and later from global suppliers. It was clear the market needed an education, sourcing and networking event for the excipient market. The conference and expo grew from 120 participants to more than 600 manufacturing professionals and excipient manufacturing suppliers. ExcipientFest property was separated from Mutchler Inc. and a stand alone company created in 2002 to grow the event and expand it beyond the manufacturing market in Puerto Rico. 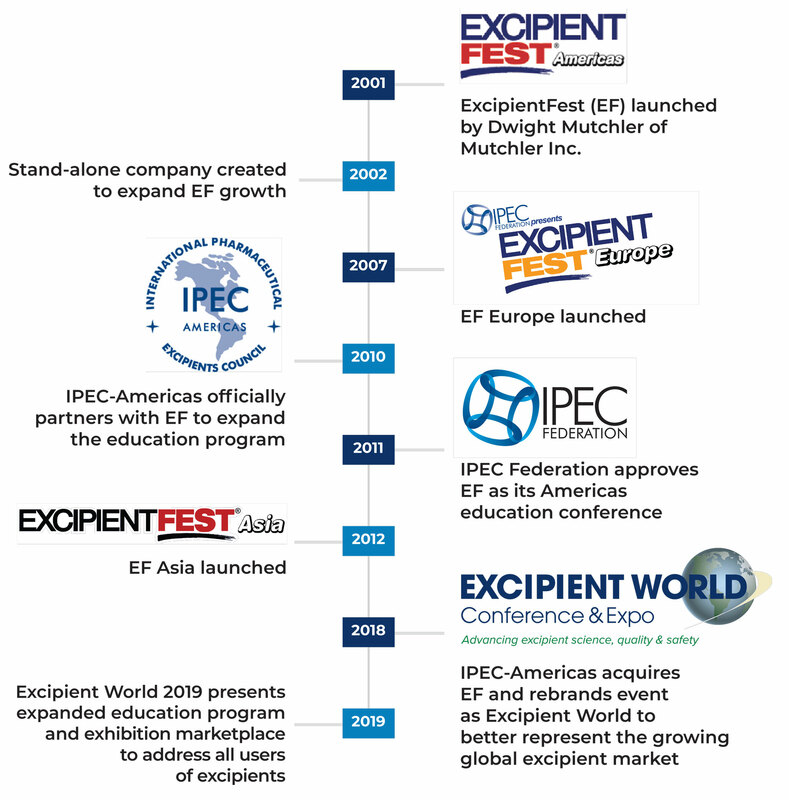 IPEC-Americas became an official partner of ExcipientFest in 2010 to further expand the conference program to include regulation and compliance education, as well as attract more excipient manufacturer members as sponsors. IPEC Federation named ExcipientFest its official event in 2011. ExcipientFest moved its place of business to the IPEC-Americas office in Arlington, VA in 2014 to further expand collaboration between the organizations. Since 2001, ExcipientFest has produced a total of 23 events (16 in PR and the Americas, 4 in China, 3 in Europe). In 2018, IPEC-Americas officially acquired ExcipientFest to fulfill their mission to effectively support the business, science, quality and safe use of excipients in pharmaceutical manufacturing and educate all excipient end-users on the proper use and applications of excipients and ingredients. ExcipientFest was rebranded to Excipient World Conference & Expo to better reflect the growing international market for excipients and excipient sourcing and the important role excipients play in the enhanced efficacy of drugs and products while delivering innovations to market faster.